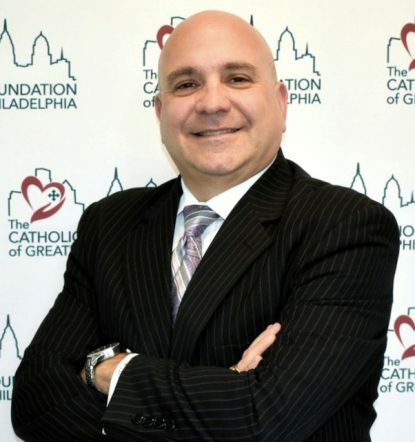 Angelo J. Valletta, president and CEO of the Catholic Foundation of Greater Philadelphia. Angelo J. Valletta, who was appointed president and CEO of the Catholic Foundation of Greater Philadelphia (CFGP) on Sept. 28, officially took up his new duties on Oct. 30. Valletta brings with him an impressive resume. Most recently the regional executive director for Fidelity Information Systems, he also served as chief information officer for EVO Payments International and senior vice-head of operations for Sun National Bank. He has nearly 30 years of managerial experience in diverse industries. But this background does nothing to tell why a man with some of his best years still ahead of him would walk away from corporate America to take charge of a nonprofit. First of all, he grew up in a South Philadelphia row home near 22nd and Wolf Streets. There was his dad, Lou, who was a printer by trade with General Electric; his mom, Mary; his older brother by 18 months, also named Lou and for a few years two of his grandparents who were sick and an aunt who was sick. When he was a kid, the legendary Msgr. Aloysius Farrell was pastor at St. Monica Parish. When the church was almost destroyed by fire in January 1971, the pastor rebuilt it better than ever. When Msgr. Farrell visited on the annual Block Collection everyone was excited and felt honored, Valletta recalls. The next pastor was Bishop Louis DeSimone, who “was a rock star for us,” he said. Valletta attended St. Monica School, which was run by the Sister Servants of the Immaculate Heart of Mary, before going on to St. John Neumann High with the Norbertine Fathers. The funny thing is, while the family had membership at St. Monica and he was an altar server there, they usually went to Mass at adjacent St. Edmond’s. The reason, Valetta explains, was simple: This was South Philadelphia and parking was near the church was impossible. Because the family lived at the edge of the parish St. Edmond was a shorter walk. As a kid he was into whatever sports were in season — football, baseball, basketball. He was not necessarily a star, but he loved it. “My dad always pushed me to my books,” he remembers. While he was in high school his brother Lou, who was his best friend and mentor, went off to college. This was a time when the personal computer was just on the horizon. Lou decided computers were the wave of the future that would change the world, and indeed he made it his career. Meanwhile Angelo had a full life of school, sports and dating his high school sweetheart, Andrea, who was from Stella Maris Parish and in the same grade as he but at St. Maria Goretti High School. When he graduated from Neumann in 1983 and was deciding on his future, his dad patted him on the back and said, “Yes, you are going to go to college, you will go to Temple like your brother. You will pick a good degree to earn a good living. While you go, you live here and eat your mother’s cooking. After college you are going to marry Andrea and give me a couple of grandchildren.” That is exactly what happened. That’s why Angelo, who also earned an MBA, entered the business side of the computer industry, putting his knowledge of computers into practical use to the advantage of the companies where he worked. Very clearly, his brother Lou was the greatest influence of his life especially in matters of faith. But he had a heart defect from birth and died at age 46, and he is still very much missed. “He was the consummate Catholic,” Valletta said. He remembers his brother stopping by the shrine to Our Lady of Lourdes at his New Jersey parish church every day for a half-hour of prayer, and spending his entire lunch hour in his office with the door closed in prayer. “I would kid him telling him he should put cream on his knees for the calluses he got from kneeling so much,” Valletta said. As for himself, the two children he and Andrea brought into the world are grown and fulfilled in the fields of their choosing. Alex is a chef and Amanda is a professional dancer and a special needs teacher. He and Andrea are members of parish the Cathedral Basilica of SS. Peter and Paul but usually go the Mass at St. Thomas the Apostle in Brigantine, N.J., where they spend most weekends. With his children grown he has more time to spend on other things. “I don’t golf, I don’t hang in bars. Nonprofits are my hobby,” he said. He is a self-admitted family guy, and one of the first outreach efforts by himself and other family members was funding a scholarship for a needy student in Lou’s memory at Temple University. He was also active with Hopeworks ‘N Camden, a youth outreach program founded by Jesuit Father Jeff Putthoff that teaches computer skills to that city’s young people. Valletta is a board member at American Red Cross in Philadelphia and also voluntarily assists a postal workers’ credit union in financial matters. He estimates he was putting 15 to 20 hours weekly into working with nonprofits. During his time at one previous employer he helped it grow in revenue from $200,000 a month to $2 million a month. “That’s what I do, I grow things,” he said. When a friend in the nonprofit field told him about the opening at CFGP he jumped at the chance to make the switch. He applied and was ultimately selected. He liked what he saw at CGFP: quick hits like Mother of Mercy House in Kensington, which is working among the very poor who are burdened with the social ills that come with poverty; helping organizations establish endowments that will fund their work in the years to come or helping individuals with planned giving programs that will fund the projects they personally consider important. It’s a big challenge but with prayer and the grace of God and incredible people helping, much can be done, he believes. In the past he’s put all of that energy into industry. Now it is time to apply it to God’s work. It’s a noble choice. NEXT: What’s a nice Presbyterian doing in a Catholic convent?